Misunderstandings are a common thread in movies directed by the Farrelly Brothers. With Dumb and Dumber To, misunderstandings have exceeded past plot and the dimwitted characters. Since Dumb and Dumber To has the filmmakers returning to the past, let’s take a look at their flawed filmography. The 90’s were very kind towards the brothers with Dumb and Dumber, KIngpin, and There’s Something About Mary scoring mightily with audiences. In 2003, matters started taking a shaky turn with the conjoined twin comedy Stuck on You and finally hitting rough turbulence with The Heartbreak Kid in 2007. They were too distracted with trying to recapture lightning in a bottle that it took a toll on their comedic timing and delivery. They redeemed themselves somewhat with Hall Pass and The Three Stooges, but it was Peter Farrelly who spewed bad taste with the star-studded whatchamacallit Movie 43. Bobby was wise to keep his distance from that one. It makes sense for the pair to go “back to the well” to regain the fire that made them original voices in the comedy genre. However, the anticipated sequel has those boys bathing in the toilet rather than figuring out how to make a modern audiences chuckle using such goofy material. It takes a while for Dumb and Dumber To to get started. The first 30 minutes are pretty rough and awkward with jokes that feel detached from the world around them. The Farrelly’s have a difficult time clueing into how clever their first film was. Instead, they focus on how many buttons they can push, and how far they can go with their PG-13 rating. A lot of the humour stays at second base – if you know what I mean. Jeff Daniels and Jim Carrey return as Harry Dunne and Lloyd Christmas, two of the dimmest bulbs in movie history. Daniels’ reunion with Harry is triumphant. It’s as if he walked off the set of the predecessor yesterday. He stays in tune with the continuity, and truly understands why Harry is such a guiltless dummy. This is a huge surprise since the actor hasn’t dabbled in something this ridiculous in a long time. Carrey is a little off his game though. Like Peter and Bobby, the funny man has misunderstood “why” Lloyd is dumb. Lloyd is someone who wants to be regarded as a sharp guy who can always impress, however he’s unaware of the fundamentals of conversation. Take “the annoying sound in the world” bit from Dumb and Dumber. He makes that gravely screeching noise because he thought it would make Harry laugh and agree with him. He has no idea that it may irritate their new hitchhiking buddy. There’s an “annoying sound in the world” joke in the sequel involving ringing a doorbell at a rapid speed. However, Lloyd isn’t focused on the doorbell. The “annoying sound” will come from those inside irritated with it. Mean ignorance shouldn’t be in a sequel to Dumb and Dumber when those ticks weren’t in the original film. The Farrelly’s, unfortunately, are convinced that laughing at another’s pain is comedic gold. It can be funny in the right context, but not when these goofballs are deliberately trying to test everyone around them. 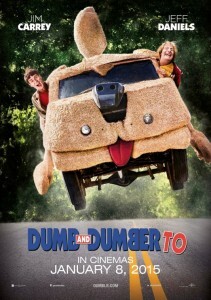 Dumb and Dumber To eventually finds the right tempo and spirit, which leads to a lot of big laughs. I smiled whenever Rob Riggle (who plays a duel role in the flick) was painted into the backdrop, I giggled whenever Carrey and Daniels had roadside mishaps, and the explanation of a certain fart game had me laughing. And while the irony may have been too obvious, the bits inside a science convention kept a pleasing rhythm. 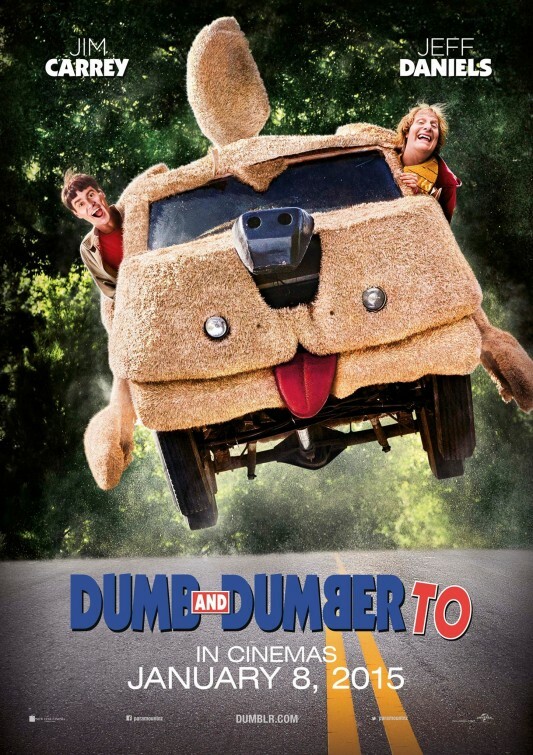 For a film that follows closely to a guideline that matches the original, Dumb and Dumber To’s story is too lengthy and has the script swinging from vine to vine in order to convolutedly connect everything. I’m glad the Farrelly’s kept the fantasy sequences since both of them feature some of the film’s funniest moments. This sequel isn’t the Farrelly resurgence many were hoping it would be, but it’s also not a complete loss. Dumb and Dumber To would’ve been much better if the Farrelly’s had kept the same energy they had when making The Three Stooges. The Three Stooges was a bit of a bust, but at least the filmmakers understood the characters they were dealing with. This film plays as more of a sequel to Dumb and Dumberer: When Harry Met Lloyd just because of how periodically out of touch it is – which is more weird than dumb.